Okay. I want you to prepare yourself for a bit of a déluge in the way of me describing to you just how ecstatically in love I am with this short story. Yes, you heard me right. Short story. What's that you say? You thought I already covered my love for Irial and Niall yesterday in my review of Radiant Shadows? Well, I thought so too. But then I stumbled across a little thing called "Stopping Time" and it became clear that this kind of love cannot be "covered" in a single post. I'm afraid you may be subject to several. Consider this fair warning. I've never actually reviewed a short story here before. So here goes. This review will include a few unavoidable spoilers for Ink Exchange and Fragile Eternity if you haven't read them yet, but none at all for Radiant Shadows. 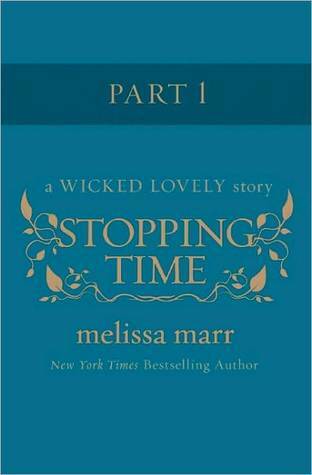 So if you're up-to-date on the series, you're good to go as "Stopping Time" takes place in between Fragile Eternity and Radiant Shadows and is the absolutely perfect read right now if you're anxiously awaiting the fourth book's release. And I really recommend that you do read it. Having already read Radiant Shadows, I can testify that it would be extremely beneficial (read: so much more awesome) if you'd read this short story first. It's been months since Leslie walked away from the allure and abuses of the Dark Court and the two loves of her life and went the equivalent of solitary fae. Going to college, seeing a therapist, and trying to make new friends, it hasn't been anything resembling easy. But it was the right decision. And Leslie knows that. She just wishes her heart would remember. That it didn't race every week when Irial sits across the street from her study group and watches her, silently letting her know he's there. That he loves her. He will keep her safe. Depending on the day, the hour, the slant of light passing through her empty apartment, Leslie wishes just once she could break one of the two defining rules that form the shape of her life now. No talking to Irial. No seeing Niall. With the former and the current Dark Kings, the guidelines "look but don't touch" and "listen but don't look" may be exquisitely hard to follow, but they go a long way toward keeping Leslie the kind of safe and independent she relies on these days. Meanwhile, Irial and Niall circle each other warily, quietly dancing around their loss of Leslie and the impossible chasm that is forgiveness and reconciliation. The three of them push on every day until an outside force alters their routine abruptly and it becomes clear someone who knows the intimate details of Leslie's past is intent on using her (and those who love her) for their own purposes. And Leslie realizes she may be forced to break one of her rules in order to protect herself and the two men she loves. 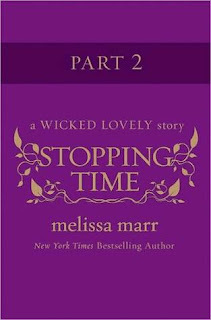 I have never read a book written by Melissa Marr. I will surely put something on my bookshelf. Alicia, lol. You must read it tonight. Then come get RADIANT SHADOWS. Do not pass Go. Do not collect $200. And I actually haven't seen Adrian in much besides The Devil Wears Prada. Sounds like I should rectify that. 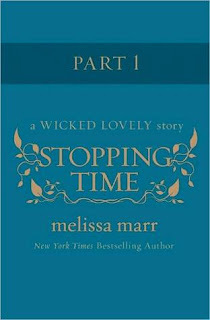 Oh I love Melissa Marr's books. Thanks so much for telling us about this. I'm like you. I can't wait to read this. So, I read your blog alllll the time. I appreciate your non-spoilery reviews and honest opinions. I have to agree with the bruised feeling at the end of Ink Exchange. I haven't read Fragile Eternity because of how painful Ink Exchange was. But I, too, really liked Irial and Niall, so I decided to take a chance on this short story, and . . .
All of it--I loved all of it. Still some pain, but sooo well done. We get to see so much strength in Leslie and the wonderfully tragic Dark Kings. And the cafe scene, *sigh*. This story is a beautiful and necessary piece of the Ink Exchange puzzle of characters and emotions. Thank you so much, Angie, for leading me to it. Jennie, *grin* I leave you with no choice. Jen, I would be freaking overjoyed if she did that after finishing this series. :) And I agree about Donia. I've loved her from book one. I just wish Keenan would pull his head out for once and stop hurting her. Ugh. Natalie, my pleasure! Let me know what you think after you've read it! a_hoffman, you should see my smile right now. It is big. :) I'm so glad you went ahead and read it. I felt the very same way after FE and this one completely blew me away. I'm with you. The best thing she's done. More. Please. whitney, wow. Thank you so much! I'm delighted you drop in all the time. And INK EXCHANGE really did a number on us, didn't it? But somehow I just fell for those characters more than any of the others. They're just so much more sympathetic and layered to me. You should definitely just go ahead and read RADIANT SHADOWS now because there are a couple of scenes in it with Irial and Niall that you will love. I really like Seth because of his devotion to Ash, giving the ultimate sacrifice to become Fey. I love this series and would love to win. Thanks for hosting the contest. And I shall trust you about RS and let you know what I think. I really look forward to your posts. Quite nerdy and perhaps obsessive, but I have no shame. hahaha. Next on my list is Graceling, which I've heard has some specific similarities to The Hunger Games trilogy. Hope your weekend is bright. whitney, you're in good company then because I have no shame either. ;) Clearly. Nerdy and obsessive go without saying. And I'm thrilled you look forward to the posts. As you know, I loved GRACELING. I read it back-to-back with THE HUNGER GAMES so some of those similarities stood out to me as well. But overall they are quite coincidental as Cashore and Collins' writing styles are really different. Can't wait to hear what you think! I love your blog - I just finished Fragile Eternity yesterday and was so excited to hear about the short story. Sadly, I can't find it on amazon to download. Argh!!! Vicky (I'm assuming this is Vicky :)), I'm so sorry you couldn't find it. Here's the link I used on Amazon for Part 1 and Part 2. If those don't work, you can also download it for free from Harper's site here. Just download the free Adobe Digital Editions software in order to be able to view it. Worked great for me. Let me know if you still run into trouble! Haven't read any Melissa Marr yet. I might just have to start.